Great conditions, fun group but rock route more chossy and less clean than expected. 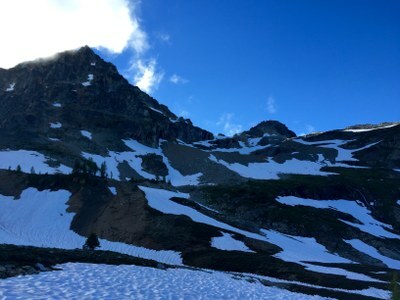 firm snow at the base of climb, requiring crampons, ax. Hiked in Saturday late morning (4.5 hours) and settled in with gorgeous skies and the Everett scramble group for company. Left camp Sunday at 6am. We used crampons at the top of the snow towards the notch (2 hours). We were concerned we were off route, mostly because we were expecting better quality rock. Used half rack and 30m ropes. Made it to summit without issues. Back to camp around 5pm. Hiked out that evening, staying mostly on lower trail (skiers left) to avoid lots of boulder hopping.